Last night I attended a wonderful kirtan (chanting) session at the Sydney Govinda’s Restaurant’s downstairs ‘temple space’ in Darlinghurst. These sessions, as well as other events like yoga and philosophy, are regulars on the Govinda’s calendar. 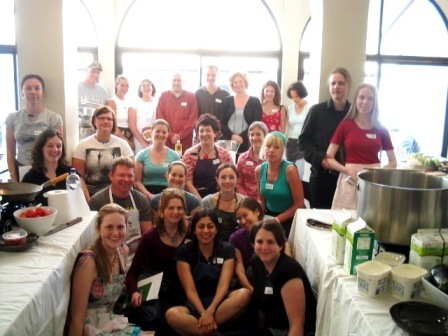 Talking of regular events, places at my scheduled cookery classes at Govinda’s Sydney are filling fast. In fact, my Saturday May 10 class is totally booked out, and vacancies in my Saturday June 7 classes are going fast. So for those who are thinking of coming but are waiting to book a spot, the motto is Carpe Diem – Seize the Day! Actually ‘Carpe Diem’ is a phrase from a Latin poem by Horace. It is popularly translated as ‘seize the day’, although a more literal translation of carpe would be ‘harvest’ (‘harvest the day’), as in the harvesting of fruit. So if this stirs something inside you, go to the Govinda’s website and make a booking, right now.